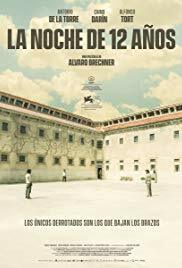 A Twelve-Year Night (Spanish: La noche de 12 años) is a 2018 Uruguayan drama film directed by Álvaro Brechner. It premiered in Official Selection at the 75th Venice International Film Festival, and it was selected as the Uruguayan entry for the Best Foreign Language Film at the 91st Academy Awards, but it was not nominated. The film won the Golden Pyramid Award at the 40th Cairo International Film Festival. A Twelve-Year Night won the Golden Pyramid Award at the 40th Cairo International Film Festival on 29 November 2018. The film received six nominations for the 6th Platino Awards, including Best Ibero-American Film and Best Director. ^ "A Twelve-Year Night". Box Office Mojo. IMDb. Retrieved 30 November 2018. ^ "A Twelve-Year Night". The Numbers. Retrieved 30 November 2018. ^ "Alvaro Brechner on A Twelve-Year Night, Exploring the Human Condition". Variety. Retrieved 25 September 2018. ^ "La noche de 12 años: lo más visto del fin de semana y seleccionada por Uruguay para el Oscar". El Observador. 25 September 2018. Retrieved 25 September 2018. ^ Mango, Agustin (27 September 2018). "Oscars: Uruguay Selects A Twelve-Year Night for Foreign-Language Category". The Hollywood Reporter. Retrieved 27 September 2018. ^ Vivarelli, Nick (30 November 2018). "A Twelve-Year Night, Uruguay's Oscar Candidate, Wins Top Prize in Cairo". Variety. Retrieved 4 December 2018. This article related to a Uruguayan film is a stub. You can help Wikipedia by expanding it.